Vegan eating seems to be growing in popularity these days. I haven’t embraced it but another family member, my daughter, has. And she’s doing a fascinating blog, Maplehood Kitchen, along with friends posting vegan recipes she’s tried as well as reviewing vegan dishes at restaurants. 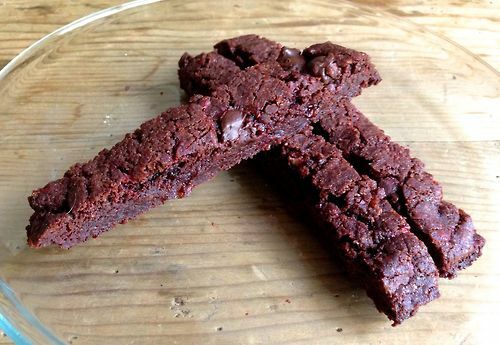 Vegan biscotti, courtesy of the Msplehood Kitchen. Portland, Ore., is her base of operations these days, so her blog has several restaurant reviews in that city as well s recipes she’s tried from a variety of sources. One cautionary note, vegan food isn’t necessarily low-salt, some of the meat substitutes have quite a lot of salt and at least one place in Chicago I’ve written about, the Protein Bar, that serves vegan dishes has a menu loaded with salt. So keep that in mind when you’re looking at some of the possibilities.